Heists don't usually involve large quantities of purloined citrus. When thieves seek to outmaneuver the cops in a hot pursuit, the stakes are usually much higher. But not so in Seville, Spain, where police officers pulled over two motorists who were driving erratically last week. 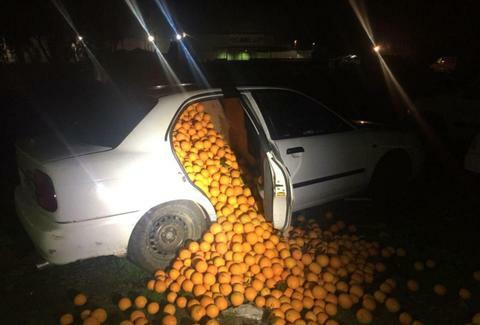 When the officers opened the suspects' car doors, mass quantities of stolen oranges tumbled out, like a grocery store's worth of illicit produce. The bounty weighed in around four tons, which isn't an abnormal weight for a male elephant, for perspective's sake. The cops understood something was amiss when they encountered the two motorists driving closely together, side-by-side. After trying to pull the suspects over, a short chase through a country dirt road ensued. It turns out, though, that evading the police is harder in a clown car stuffed to the brim with fruit. The suspects' efforts were quickly foiled. According to local reports, five family members were charged with stealing the oranges from a shipment. The family originally stated that they'd driven a long distance and were casually picking up oranges along the way, as if the country of Spain is really a sprawling orchard littered with easily accessible oranges, ripe for the picking. While unfortunate for the family and everyone else involved, the strangest twist to the story might be that this unfolded nowhere near the state of Florida. Sam Blum is a News Staff Writer for Thrillist. He's also a martial arts and music nerd who appreciates a fine sandwich and cute dogs. Find his clips in The Guardian, Rolling Stone, The A.V. Club and Esquire. He's on Twitter @twtwitter.com/blumnessmonster.